Dr. Michael Hamann graduated from the University of Minnesota in 1972 with a Degree in Dental Surgery and received the outstanding achievement in Periodontics award. He spent the next two years as a Navy dentist at Camp Lejeune Marine Corps. Base in Jackson, North Carolina. 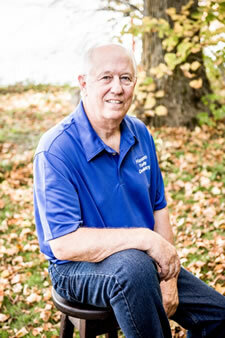 Dr. Mike opened his practice in Perham in 1974. In April of 2014 he was award by the Minnesota Dental Association the Outstanding Service Award. He is a member of the American Dental Association (ADA), Minnesota Dental Association (MDA) and West Central Dental District and is the Chair of the Constitution, Bylaws and Ethics Committee of the MDA. Dr. Mike is married to Tricia and father of Shayne, Natasha and Brooke. He has seven grandchildren, Drake, Dylan, Savannah, Kadence, Landon, Sklyar, and Slade. Dr. Mike enjoys spending time at the lake with his family in the summer, hunting in the fall, reading, and taking their dog, Harper Lia, for walks.